You no longer have to get under the hood to adjust the temperature at which your coolant fan goes on. Now you can set the coolant temperature right from the driver's seat. 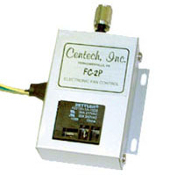 The FC-2P controller is continuously adjustable from approximately 130 - 250 degrees. The air conditioning hook-up turns on the coolant fan whenever it is needed. The kit contains the controller box with LED and heavy-duty relay, labeled wire to run to your gauge, protective fuse link, and complete instructions. We've designed three versions of the FC-2P fan controller to work simply and effectively with your gauges, whether they are electrical, digital or mechanical. If you have electrical gauges, simply hook up the FC-2PG to your water temperature gauge and attach your current fan wire to the unit's lugless terminal strip. The FC-2P box monitors your engine temperature at the gauge and turns the fan on when the temperature you've set is reached. There is nothing placed inside your cooling system, so there are no coolant leaks! If you have digital gauges, the FC-2PD is similarly connected to the electronic gauge box where it reads the temperature and turns the fan on at the pre-set point. The FC-2PE is designed to work with mechanical gauges, requiring the simple installation of an electrical temperature sender (with 1/8" pipe fitting) into your engine's water jacket to monitor the temperature.